In November, we head southeast down Misamis Oriental and revisited Duka Bay to relish once more its impressive depths. The bay has been a favorite back when I was just starting my dive pursuits. It is just few kilometers from Cagayan de Oro and I have good friends managing a diveshop in the location, this was my playground during my advance open water (AOW) course. The local government also exerted efforts for marine conservation and preservation – marine sanctuary maintenance, installation of artificial reefs, coral restoration and dive clean-ups. Their labor was intensive and the support for them was gratifying. The site is practically a good destination for weekend get- away. The weather cooperated with us on that Saturday morning when previous days it was pouring hard, mysteriously the viz was good enough for our dives. There were no other divers so it was again an exclusive one for us. Edward, Jolem, Badette and Lemuel of Duka Dive & Aquasports were there for us. We were aiming for Mother Mary’s statue which is something new in Paradise, it was planted early in CY 2017 and has become an attraction in the bay. It was our first stop, she was there standing in the middle of white sandy slope away from the crowd. So alone, so serene. It reminds me of MUSA in Cancun, Mexico – but with only one statue it is a far cry. Marine critters started to inhabit the statue, actually promoting coral life. We proceed to that big crater full of tropical fishes, I positioned in the by-side, paused and watch in awe the busy stream of resident fishes swimming, darting, wiggling before me. We passed alibuags sending shivers as it was too cold to ignore. Duka is famous for these fresh water springs underwater, how uncanny nature is! There was a parade of giant snappers and a big turtle appeared. We entered a small cavern full of golden cardinals, swimming madly as we got near! 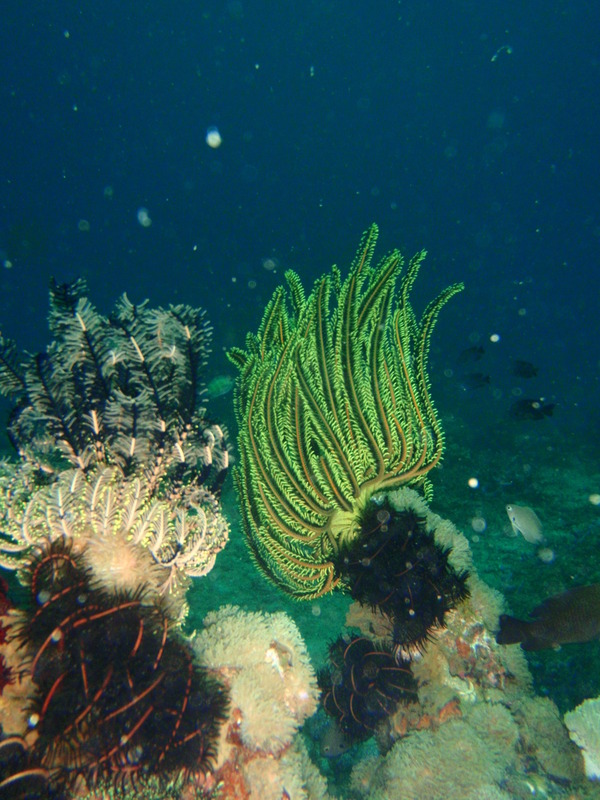 The area is now more full with soft & hard corals, decorated with crinoids, whips and other invertebrates. Still a paradise, as it was! Our last dive was at the Aquarium with an inner reef for the wide coral field and outer reef to the deeper part of the site. We descend on a sandy slope unto a large colony of garden eels, so many of them! And again, I linger for a moment to just watch them come up from their burrows inch by inch. Their shyness is endearing! There were lot of tropical fishes in variety, few nudis and a cluster of giant clams. We found too stonefish and a juvenile yellow frogfish. 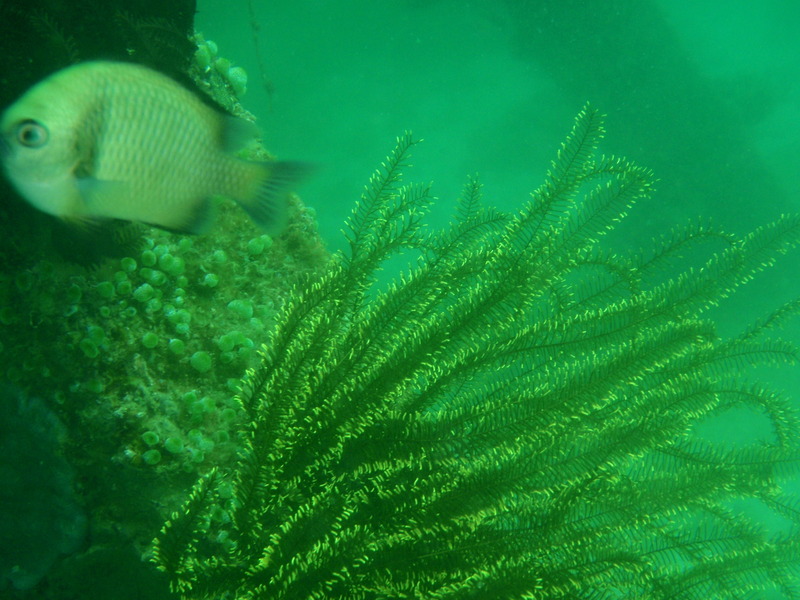 We roamed around the coral fields, biding our time and watchful for critters. There were alibuags again scattered, and true to its name as it was before, it is indeed an aquarium! Just marvelous, the bay can never be outdone in its diverse marine life, and coming back after some time with a deluge of sightings was refreshing enough and brought back memories how replete this once my playground in the early days! The guys went up in another boat for another spot for their game fishing, while I went with my mentor and his wife for another spot to Acanthasia for our fun dive. Just like my previous dives with my mentor, I’m all too confident it’s going to be effortless and safe descent in his territory at the bay. The waters was bit choppy, and was all greenish due to the plankton season as explained by Mario. So the visibility was poor, it was all hazy. But I was all forward looking what to discover for my cam, I need to learn more with the adjustments to get better photos underwater. We descend at 60 feet as deepest to get around in the sanctuary, I felt overwhelmed with the fishes getting near, suddenly the scene went lively as we fed them (sorry, again!). So near I wanted to pet them with my hands, but they’re so quick and mistakenly bumped my hand! I just watched them in awe and grateful for the chance to get close encounters like this right in their own habitat. We went around following Mario while taking photos until we lost Ma’am Cristy. I stumbled upon a reef with crinoids, colorful corals and anemones and stop for some shots, only to find out moment later Mario was gone! I went to follow his directions but decided to get back to the reef hoping he would try to look for me. 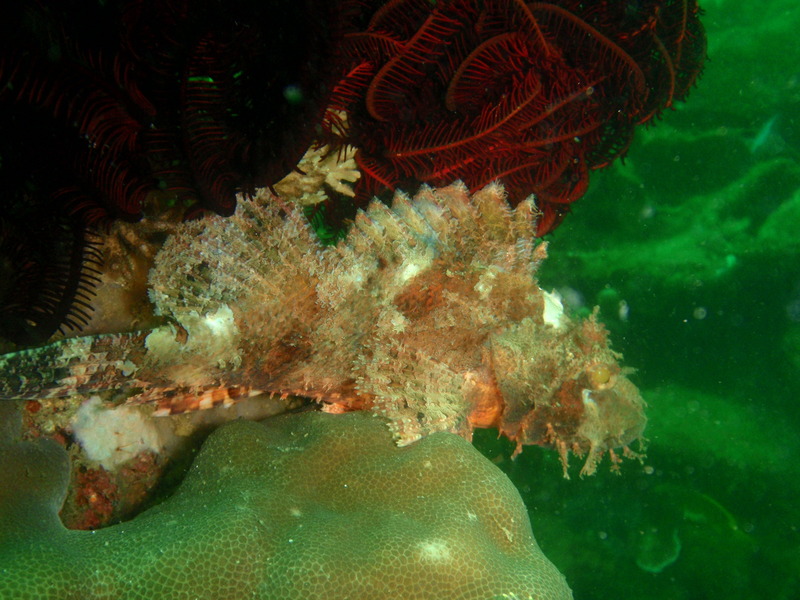 It was heart pounding to be alone down, I was trying to think my next move when I noticed a camouflaged colorful scorpion fish right in front of me! 🙂 If I didn’t get back to the reef I wont get the chance to see this rare specie. SRTA – I decided to head the beach direction to get shallower as my air is getting down. Slowly I surfaced with my air at 500psi, about 60 meters away from the boat! After some pleasantries and consultation from my mentor and reminding him of the Tubbataha Dive plans, I left the shop but not without having me brought to the bus stop by Gonz & Edward. Riding on the bus heading home for Butuan, I was reflecting on some lessons for the day’s events. Sometimes, the Lord allows situations when we felt helpless and vulnerable, not to harm us but to learn something valuable and important. I learned to find my own way and ascend alone unharmed and got delighted as I stumbled an elusive rare scorpion fish by myself. And Mario is indeed a good mentor (actually he was annoyed with my mistakes but handled it well! ), he can always be depended on in my diving lessons needs and concerns. The Lord always made things perfect for everyone everytime – especially on valuable stuff that warms your heart! There is always something new in every dive I had and indeed there are surprises and lessons in store in my every underwater encounters – what a joy! J Despite pretty hectic schedules in December, Angel and I tried to fit in one dive trip (my last for the year) last weekend. Mindanao has a perfect sunny weather on year ends except two weeks ago when Typhoon Urduja strike Northern Mindanao leaving floods and landslides in some parts in Misamis Oriental. I was suggesting for a hop to Camiguin but Angel wanted to have a side trip to Butuan for his cravings at Margie’s Kitchen. Duka Bay would be a strategic site for our dive given itinerary plans. I have been eagerly waiting for this last 2009 dive with Angel. DM Edward suggested to call it a day, the waters became too choppy and the viz is getting hazy. Angel and I planned for three dives but agreed with him, we felt exhausted too after the two challenging dives. We packed our things and left Medina for Butuan a little past 3pm. One thing keeps nagging my mind – I need a dive computer soon! We arrived home after sundown, just right for our plans for the night. I guess Angel is getting fanatic with Margie’s, because the next day before our leaving back to CdO we went there again with Kay for lunch, just imagine we were the first customers on that Sunday, we were just right at their doorstep when the coffee shop opened! 😛 We tried other menus but never eliminating the cookie monster and cheesecake, we had another sumptuous meal again! It would still be long before Angel could get back to Butuan for Margie’s Kitchen. This time we never missed the chance to scribble on the café’s wall, we tried to beg the staff to let us do it. Voila, Lakwatsero invades Margie’s Kitchen! And yes, we had our photo taken by the shop – hopefully to be posted in the shop’s bulletin board. Back to Paradise and Aquarium! After a wonderful get away with Angel at Anilao for our long planned dive, I had the opportunity to dive again with my mentor’s group for a cleanup. It was unplanned though to have another dive on a consecutive weekend. It was just hard to resist aside from being low-cost, I will be revisiting one of the amazing sites in Duka Bay for underwater cleanup – my first time to be involved in such endeavor! Grateful that my dive mentor invited me even on a last minute notice! We packed our gears and convinced Karen to just come back with me to the city, she decided earlier to stay for a night bash at the resort – the men are having a party! We settled our bills and waited for Mario who was diving with another group. When they got back, we had pictures for Project Aware documentation, a form was filled up for the marine debris gathered. We said our byes and we we’re transported to the bus stop. It wasn’t long the aircon bus came and finally coming home. Unknowingly, the typhoon has ravaged the metro and in state of calamity!